About 1500 BC, a new group of people seem to have come to India from the north-west: this time, they were the Yamnaya. The Yamnaya came from Central Asia, between the Black Sea and the Caspian Sea. We also call these people the Indo-Europeans, because between 2500 and 2000 BC, many Yamnaya people migrated all over Eurasia, probably because of the same climate crisis that ended the Old Kingdom in Egypt. Some of the Indo-Europeans went to Europe and became the Germans and the Romans and the Greeks. Some settled in Turkey and became the Hittites, or went east to China where they influenced the Shang Dynasty. Others migrated south-east instead. Some of them stopped in Iran, while others kept on going south-east to Pakistan and India. The slow migration did not arrive in northern India until about 1500 BC. In India, historians sometimes call the Yamnaya people the “Aryans”. Some people don’t agree that that Yamnaya migrated to India, and if you search the web you will find some sites saying that it never happened. But there are written records of the language that Yamnaya people brought with them to India, Sanskrit. We can read Sanskrit, and we can easily see that many words in Sanskrit are basically the same as in other Indo-European languages like German or Persian. In addition, recent genetic evidence from DNA shows that people in India have some Yamnaya ancestors. The Yamnaya brought both their language and their gods with them to India. These gods combined with local gods and local stories to make Hinduism. Hindu priests wrote these stories down for the first time in the Yamnaya language, Sanskrit – that’s the Rig Veda and other sagas. 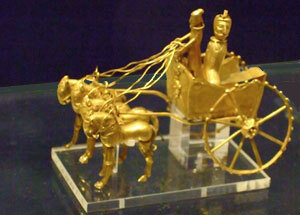 The Yamnaya also brought the domesticated horse and chariot to India. We call these Indo-Europeans in India the Vedic people. 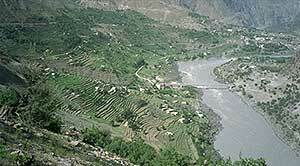 Vedic people first settled along the Indus River, in the same place where the Harappa people had lived. They settled down and mixed with the local Indian people. They lived there from about 1500 BC to about 800 BC. It was probably about this time that the caste system got started in India. About 800 BC, the Vedic people learned how to use iron for weapons and tools. They probably learned to work iron from the Assyrians in West Asia, who had learned it from other Indo-European people, the Hittites. Once Vedic people learned how to use iron, they used their new weapons to conquer more of India, and moved to the south and east into the Ganges river valley. They settled in the Ganges valley not long after 800 BC. Indo-Aryan Controversy: Evidence and Inference in Indian History, by Edwin Bryant (2005). A scholar’s discussion for other scholars of all the evidence concerning Indo-European nomads coming to India (for and against), written for adults. The Aryan Debate, by Thomas Trautman (2005). A collection of past writings about this question, designed to show why it is so political and what the problems are with the evidence. Cite this page: Carr, K.E. Vedic India – history of India. Quatr.us Study Guides, July 20, 2017. Web. April 21, 2019.